of neo-Dadaist South African sound art. Surfers are not a group, underground or otherwise. and most repressive years of the apartheid regime. visions have featured in several Surfers albums. through a subtle manipulation of the live recordings. track” which first appeared at the Dada South? Well, the firebrand Warrick Sony is back — and he is angry. 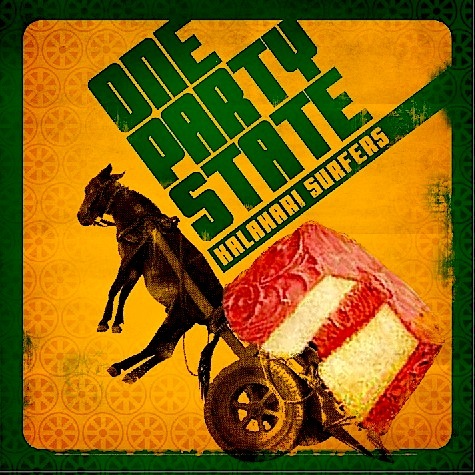 With his new album, One Party State, Sony returns to the overtly political song structures he created in the 1980s, but with a dystopian dubstep edge added to the mix. Sony is on the attack and he has the ANC-led government firmly in his sights. Lock and load. “I am feeling a rage that I haven’t felt since the bad old days,” says Sony. “A rage at being the joke of the world, being ashamed to be from here again is too much. “We have something approaching anarchy with a government so wrapped up in criminal prosecutions and court cases and infighting and backbiting that it is hard for it to find time to govern,” he says. “I have been feeling that a lot of the idiocracy going on now is not unsimilar to what we were dealing with in the 1980s. The kind of ‘Should I cry or should I laugh?’ moments with our political personalities that are very familiar to a lot of us who were creating artistic work during the apartheid years.